New Design & Construction – more than 5,000 sq. 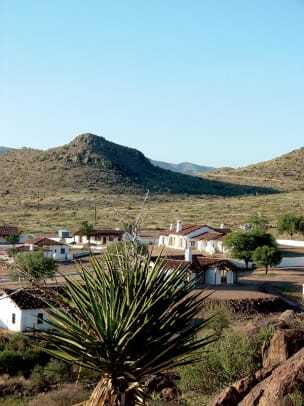 ft.
Nestled at the base of Davis Mountains in West Texas, where miles of undeveloped land still remain, is Rancho Del Cielo or Sky Ranch. It overlooks vast prairies, mountain ranges, the open sky, as declared by its moniker, and is situated right at the mouth of Rough Canyon. 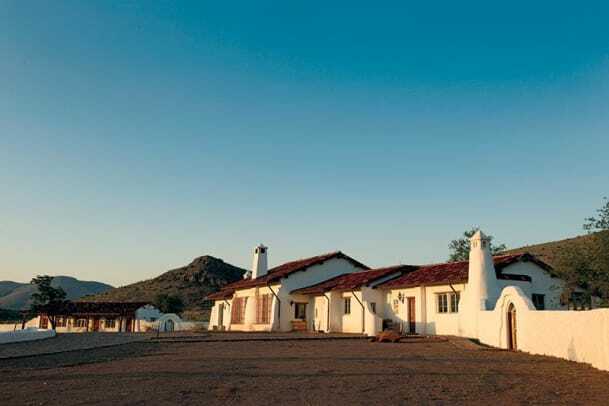 The homeowners, an international couple, fell in love with the 1940s ranch compound, designed by an unknown Los Angeles architect as a ranching outpost for a Texas railroad baron hundreds of miles from the nearest town. 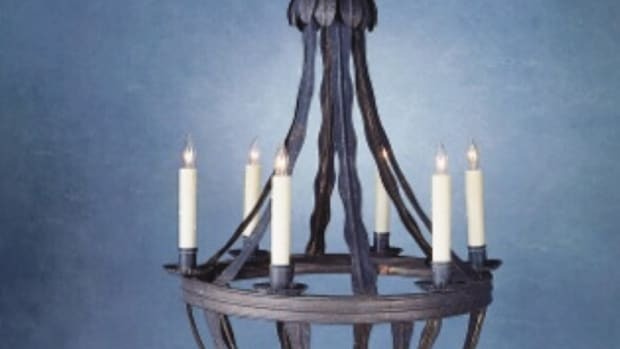 In 1995, after the couple had moved their furniture, antiques and artwork into what had been the ranch headquarters, the ranch manager awoke to find that the house had burned down overnight when a fog sparked the antique wiring. As the original house was adobe, it acted like an oven, incinerating everything to the point where there were puddles of steel on the floor; only the basement and structural foundation were left after the disaster. Existing structures on the compound included two guesthouses, an old chicken coop, a large adobe barn and a perimeter wall, all of which are situated around a ring road. The new house is sited adjacent to one of the guesthouses and reconnects with the perimeter wall. It is built on top of the surviving basement and structural foundation for cost-effectiveness and the former concealed some of the program. Respecting the scale of existing buildings, the façade facing the drive was minimized by offsetting the peak of the roofline to create a lower ridge. The two side wings were layered back further from the drive to form a crenulated façade that obscures the large mass of the house. To understand the landscape and site, Imber studied renderings by architects famous for the California Territorial style. He emulated their technique of rendering for the conceptualization and that served as the basis to keep the integrity of the design on track throughout the project. 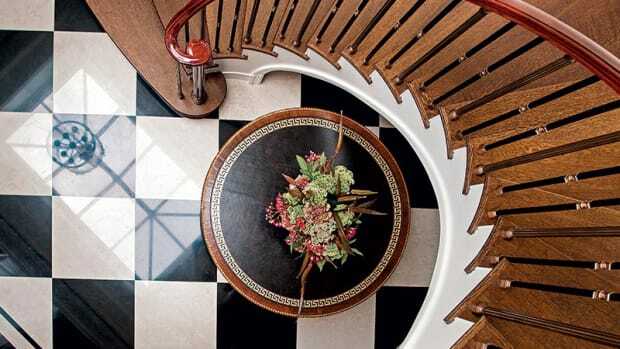 The team also relied on stories about the house for the details throughout. For instance, they heard that the window grilles were made of old cypress water well sinker rods but had to reinvent a way of lashing them together by using leather straps. 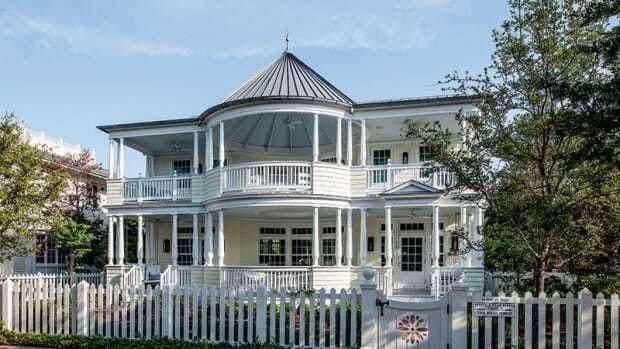 The simple white plaster walls, chimneys and red clay roof tile, the latter of which was supplied by Carrollton, TX-based Roof Tile & Slate Co., were cues picked up from the existing buildings. An antique door imported from Spain for the main entry exudes a sense of age and timelessness and informs of what is to come. It opens to an intimate foyer and a direct view of Rough Canyon. The southeast wing is the service portion of the home housing the kitchen and pantry, a powder room, storage closets and the dining room. As per the clients’ request to have several dining areas, a niche extends off the dining room with three sides of windows and French doors, manufactured by Wausau, WI-based Kolbe Windows & Doors, for a more private dining experience. The dining room itself is adjacent to a courtyard and fountain that was built over the roof of the basement. It features white plaster walls, a conch alcove for the buffet and rustic floor tile. On the ceiling, there are carved Ponderosa pine beams and aspen latias; both were supplied by Las Cruces, NM-based, Trails End Woodworks and the latter was harvested from the Sangre de Cristo Mountains of northern New Mexico. In the northwest wing, the formal living room is focused around a redefined pecho de paloma (breast of a dove) plaster hearth and is complemented by plaster conches above the windows. The ceiling treatment in the dining room is reinterpreted here in the form of handcrafted Panderosa pine corbels and beams. Antique chandeliers complete the space. The connecting family room is flooded with natural light via the French doors that open to the terrace and courtyard. The adjacent guest and master bedroom suites are separated by a third dining area. Tucked in the corner between the master bath and walk-in closet is a private office; a separate side entry leads back to the main drive. Across the road from the main house, the team designed an office pavilion for conference meetings. It contains a bathroom, a full kitchen and the meeting room features three walls of French doors for the option of an open or closed environment. The highlight of the pavilion is an antique 16th-century Spanish door with custom hardware designed by the firm. Robb Gunter of Architectural Metals in Tijeras, NM, crafted the hand-wrought iron and brass door hardware. “Due to its remoteness, the main challenge of this project was construction,” says Imber. 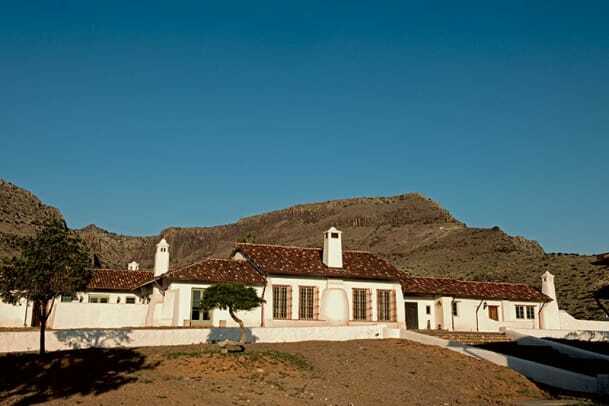 “Rancho del Cielo is in the middle of far West Texas on 40,000 acres. We had to bring in subcontractors and building crews from three hours away and set up camps to maintain a reliable work schedule.” In addition to the great distance, a ten-hour drive from San Antonio and over three-hours from the nearest airport in El Paso, the crew also had to withstand the extreme weather of the region, such as severe heat, dust storms, snowstorms and the occasional “mud storm” where dust storms would occur in tandem with rain or snow. “In trying to create a house that satisfies modern lifestyles, we really tried to capture the spirit and character of the house that had been so that it maintains the same sort of relationship with the dramatic landscape of the original compound,” says Imber. After a 10-year design and construction process, Rancho del Cielo’s success has earned the firm its fourth Palladio Award in 2014.